This well-established family practice has been in its present location for 18+ years. Located at a very busy intersection in Thornhill, this practice has easy access to bus routes, and there is ample free parking for patients. A total of over 1,300 patients have been to the practice for one or more appointments in the past 12 months, with over 1,200 patients having one or more hygiene visits, translating into a 90% compliance rate. 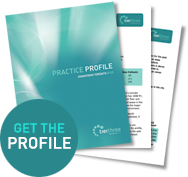 The practice has an above average hygiene program, with resulting upside potential on the dentistry – a testament to the conservative, preventive oriented philosophy of the practice. If you enjoy doing ortho, oral surgery, or taking on paediatric cases, you could bring these procedures in house and increase the current revenue and your cash flow. The practice is located in a 1,660 square foot facility that includes 3 equipped operatories, room for a forth, a doctor’s private office, a consult room, as well as a staff room. The current term of the lease expires in 2017 – so while most purchasers will simply renew the lease and continue the practice in its current location, this is also a great opportunity for dentists in the neighbourhood who wish to transition the patient base into their existing facility. As the scarcest resource in dentistry is patients, who wouldn’t want to add another 1,300 patients to their practice, without incurring the additional rent costs! Practice viewings will be scheduled by appointment only after interested parties have reviewed the practice appraisal.